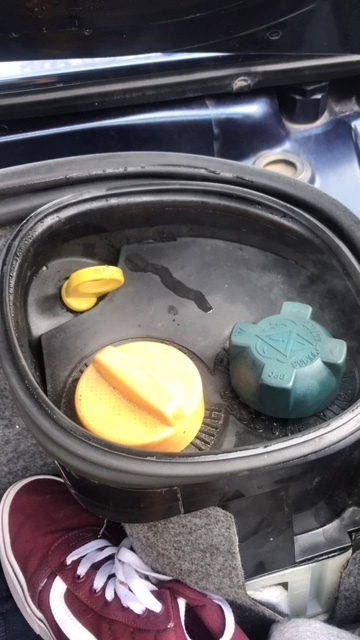 I have a 2000 Porsche Boxster an noticed some condensation as well as smoke coming from the dipstick/coolant tank and oil refill in the trunk of my car. if anyone has any suggestions/comments/thoughts let me know. My guess is your car is running a bit hot and blowing off some pressure. If you take both caps off and remove the plastic cover, you will find the pressure relief valve underneath. It has two o-rings that can go bad, the relief valve can go bad and you might need the updated coolant cap. The latest part number rev ends in -04. When your system purges, it dumps coolant under the cover that drains out through a hole in that dished area. While you are in the trunk, try pulling up the carpet and check to see if you have any coolant underneath. Your coolant tank may have developed a leak. Make sure you let the system cool down before trying to take the coolant cap off. That will also indicate issues with Cap/Purge valve/Tank. Smoke from oil fill and dip stick, I don't know about that. Maybe after a longer drive, removing the cap maybe one might expect to see some vapor escaping. Last edited by kk2002s; 03-19-2019 at 04:09 AM. Check your coolant cap. The latest one ends in 04 and yours doesn't look like it does. Older caps may have a weak release spring and allow pressurized coolant vapour to escape. Get new one regardless P/N 99610644704.